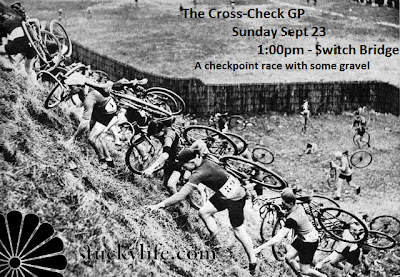 Tom Skinner has stepped up to organize Victoria's next less-sanctioned race: The Cross-Check GP! "A checkpoint race with clues to where the finish line is. Bike and brain required. There will be some gravel sections, but everything should be ridable on slick tires. There will be prizes, free entry, and good times on bikes. Invite your friends." Anyone still having problems loading the poster?